Happy Friday!! Today I have a guest post for you from Christina of Simple Easy Style. Christina's style includes lots of maxi dresses, fun colors, and patterns - all things I love! Take it away, Christina. 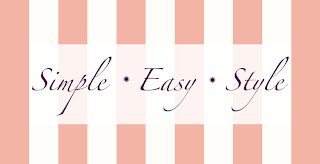 Hello, my name is Christina and I'm the blogger behind Simple Easy Style. I am so excited to be guest posting for Kristina while she is out of town. Kristina Does the Internets is one of my favorite blogs. I have always loved clothing, ever since I could remember. Most of my favorite childhood memories were spent playing dress up. Fashion is so much more to me than just something I'm wearing. It's a fun way to express myself, for me it's a creative outlet. I love pulling inspiration from different places and translating it through my outfits. I hope to see you all over at my blog! Thanks so much Christina! Make sure to check out Simple Easy Style. Today we're headed to Marrakech, which is the part of the trip I'm most excited about. I can't wait to navigate the huge markets and experience all of the culture. I hope all of you have a great weekend!! Great collection of outfits, Christina! I LOVE her style! I am going to go check her out.